Shadow is playing at all the major film festivals this fall, and will likely get an official release in 2019. From the Venice Film Festival: "this action-drama tells the story of a powerful king and his people who have been displaced from their homeland and long to win it back. The king is wild and ambitious, but his motives and methods are mysterious. His great general is a visionary who desires nothing more than to win the ultimate battle, but needs to lay his plans in secret. The women of the palace are tragic figures, caught between being revered as goddesses and treated as mere pawns. And then there is the commoner, the 'everyman' around whom the inexorable forces of history swirl, always ready to swallow him up." Watch the first trailer here. Zhang: "Many things, feelings especially, are common to all human beings. As long as the film appeals to universal human feelings, all audiences will enjoy it." 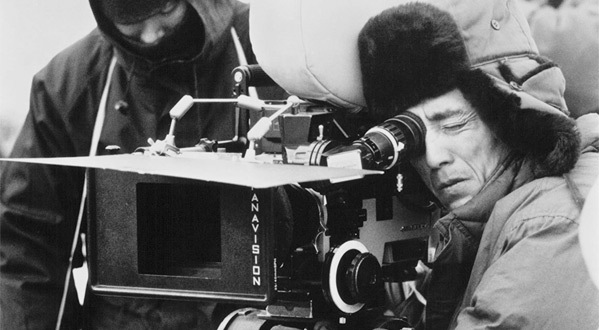 I met with Zhang Yimou in person while attending the Toronto Film Festival for this interview. The only time they could offer was before the film's premiere that evening, so I only had this time to talk with him before seeing the film. He was much more quiet and humble than I expected, but still happy to talk about filmmaking and his work on Shadow. The interview was conducted with the use of a translator. Read on for our brief conversation about cinema and stories. You've made so many iconic films over so many years so far. Have you noticed any major changes: is the film industry getting better, or worse? Are films getting better, or worse? Zhang Yimou: Well, since I'm more familiar with the film industry in China, I'll begin by talking very briefly about the film industry in China. I think we can look at this question from two perspectives. On the one hand, the market in China is expanding rapidly with increasing box office as well. But on the other hand, the problem with that is that sometimes people will judge a film based on its box office performance. And therefore a lot of box office successes actually need to enhance [improve] their quality, and diversification in the industry as a whole, as well. In terms of the movie industry across the world, I'm not an expert. I'm not extremely familiar with it. But maybe, I think, it's: entertainment. It's become an increasingly important element. And culture, on the other hand, has become a little bit sidelined now because there are so many blockbuster movies out there about entertaining people. Zhang: Yes, indeed. Of course. I believe a great film has to be, first of all, artistic. It has to be beautifully done. Nowadays there are just so many films and TV shows out there that it's like fast food. And there's no strong artistic element to it. And secondly, a great film has to be deep. It has to be impactful. And tell an amazing story. Zhang: For me the biggest challenge would be finding the perfect story — a great script. That's… As a film director, I have so many ideas, so many dreams to make all the kind of films I want [to make]. But it's hard to find a story that really attracts me. A story that reflects today's world, the reality of society. Zhang: As you know the Chinese film market is booming. So the market is actually very segmented. There are lots of good ideas, lots of good stories, but also lots of [different] channels for the stories to go to. And so… I don't expect to receive many, many good ideas, or stories, all the time. So I go out on my own as well to search for these ideas. And it's sometimes just purely by luck or by chance that I find, I stumble upon, a good story. And for example, this film, Shadow — actually about four years ago, another [production] company approached me with the script, but at that time, the story was purely a historical story of the Three Kingdoms era. It didn't tell the story of a body double. But I have always had this idea of making a film about a body double. So I incorporated that into the script and transformed the script with three and a half years of work. I constantly improved the screenplay and made it into this film. So it's also by chance. Zhang: Actually for many years I've always liked the idea of making a film that presents or resembles this ink brush painting style. And finally I found a story that I believe is perfect for this artistic style. Because this story is about human nature. And human nature is not either black or white, there are different shades to it. It's very rich. Just like the Chinese painting style: different shades of black, different shades of white. I think it's perfect for this story. And with the development of computer technology, it's very easy to achieve this monochrome effect within seconds. But we decided to achieve that through real objects. We put in a lot of work and effort into that, into the details. Every costume, every prop, the setting. And even the rain, we have to make the rain. The water element. Every little detail to make it more artistic and poetic. So we put a lot of work into it. All of your films have been so remarkably beautiful. There's obviously a balance between the visuals and the storytelling. Do you find yourself leaning towards one side or another? And how do you find that perfect balance? Zhang: I think you're absolutely right. We need to strike a balance between the visuals and the story itself. And for me, I believe the story is the most important thing. And then secondly it's the artistic style. Because if we don't have a great story, it's all about the visual and the appearance and then it'll be too superficial and too shallow. And so for me, we put a lot of effort into finding the right balance for this film, Shadow. Zhang: Yes, indeed. I think the aspect of constant learning is what's appealing to me about this profession. As a film director, we have to do a lot of homework, much more homework than anybody else working on the film. I have to think about every little detail all the time; about the timing, about each character, and the location and all the little things like that. So for me, making a new film every time is a learning experience. 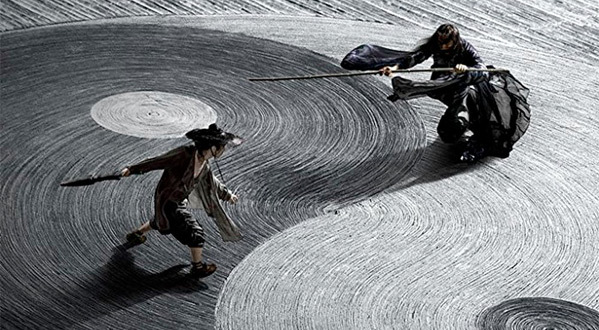 Zhang Yimou's Shadow just premiered at the Venice & Toronto Film Festivals, and played at Fantastic Fest. The film opens in China this month, but doesn't have any other release dates set yet. Stay tuned for updates.